As a child, I did not like cranberry sauce. It looked weird in its jellied can shape, and I just didn’t like the flavor. In contrast, my children love cranberry sauce! Freshly made is much preferred to [amazon_link id=”B001ELL2OM” target=”_blank” ]organic canned[/amazon_link], especially considering the BPA risk in tin cans. Here is a basic, simple recipe for cranberry sauce. Remember to make this ahead of time, as it needs to chill for a few hours to thicken. 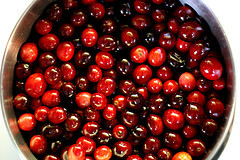 Return to boil until cranberries pop (about five minutes). Cool and refrigerate for at least three hours. I just spent a small fortune on organic cranberries, but it is worth it to serve this delicious fresh cranberry sauce at our holiday meals. « Hank D and the Bee: Happy Holidays!